Hypertext is structured text that uses logical links (hyperlinks) between nodes containing text. HTTP is the protocol to exchange or transfer hypertext. The standards development of HTTP was coordinated by the Internet Engineering Task Force (IETF) and the World Wide Web Consortium (W3C), culminating in the publication of a series of Requests for Comments (RFCs), most notably RFC 2616 (June 1999), which defines HTTP/1.1, the version of HTTP in common use. HTTP functions as a request-response protocol in the client-server computing model. A web browser, for example, may be the client and an application running on a computer hosting a web site may be the server. The client submits an HTTP request message to the server. The server, which provides resources such asHTML files and other content, or performs other functions on behalf of the client, returns a response message to the client. The response contains completion status information about the request and may also contain requested content in its message body. A web browser is an example of a user agent (UA). Other types of user agent include the indexing software used by search providers (web crawlers), voice browsers, mobile apps and other software that accesses, consumes or displays web content. HTTP is designed to permit intermediate network elements to improve or enable communications between clients and servers. High-traffic websites often benefit from web cache servers that deliver content on behalf of upstream servers to improve response time. Web browsers cache previously accessed web resources and reuse them when possible to reduce network traffic. HTTP proxy servers at private network boundaries can facilitate communication for clients without a globally routable address, by relaying messages with external servers. HTTP is an application layer protocol designed within the framework of the Internet Protocol Suite. Its definition presumes an underlying and reliable transport layerprotocol, and Transmission Control Protocol (TCP) is commonly used. However HTTP can use unreliable protocols such as the User Datagram Protocol (UDP), for example in Simple Service Discovery Protocol (SSDP). HTTP resources are identified and located on the network by Uniform Resource Identifiers (URIs)—or, more specifically, Uniform Resource Locators (URLs)—using the http or https URI schemes. URIs and hyperlinks in Hypertext Markup Language (HTML) documents form webs of inter-linked hypertext documents. HTTP/1.1 is a revision of the original HTTP (HTTP/1.0). In HTTP/1.0 a separate connection to the same server is made for every resource request. HTTP/1.1 can reuse a connection multiple times to download images, scripts, stylesheets et cetera after the page has been delivered. HTTP/1.1 communications therefore experience less latency as the establishment of TCP connections presents considerable overhead. Goals for HTTP 2.0 include asynchronous connection multiplexing, header compression, and request-response pipelining, while maintaining full backwards compatibility with the transaction semantics of HTTP 1.1. It comes as an answer to the rise of SPDY, an HTTP compatible protocol launched by Google and supported in Chrome, Opera, Firefox, and Amazon Silk browsers, as well as the pressure from alternative protocols like WebSocket. The httpbis working group considered Google’s SPDY protocol, Microsoft‘s HTTP Speed+Mobility proposal (SPDY based), and Network-Friendly HTTP Upgrade. In July 2012 Facebook provided feedback on each of the proposals and recommended HTTP 2.0 be based on SPDY. The initial draft of HTTP 2.0 was published in November 2012 and is based on a straight copy of SPDY. Many of the architectural approaches in these protocols were explored earlier by the World Wide Web Consortium‘s HTTP-NG working group. Work on the HTTP-NG project was suspended in 1998. In HTTP/1.0 and since, the first line of the HTTP response is called the status line and includes a numeric status code (such as “404“) and a textual reason phrase (such as “Not Found”). The way the user agent handles the response primarily depends on the code and secondarily on the response headers. Custom status codes can be used since, if the user agent encounters a code it does not recognize, it can use the first digit of the code to determine the general class of the response. Also, the standard reason phrases are only recommendations and can be replaced with “local equivalents” at the web developer‘s discretion. If the status code indicated a problem, the user agent might display the reason phrase to the user to provide further information about the nature of the problem. The standard also allows the user agent to attempt to interpret the reason phrase, though this might be unwise since the standard explicitly specifies that status codes are machine-readable and reason phrases are human-readable. This class of status code indicates a provisional response, consisting only of the Status-Line and optional headers, and is terminated by an empty line. Since HTTP/1.0 did not define any 1xx status codes, servers must not send a 1xx response to an HTTP/1.0 client except under experimental conditions. This means that the server has received the request headers, and that the client should proceed to send the request body (in the case of a request for which a body needs to be sent; for example, aPOST request). If the request body is large, sending it to a server when a request has already been rejected based upon inappropriate headers is inefficient. To have a server check if the request could be accepted based on the request’s headers alone, a client must send Expect: 100-continue as a header in its initial request and check if a 100 Continue status code is received in response before continuing (or receive 417 Expectation Failed and not continue). This class of status codes indicates the action requested by the client was received, understood, accepted and processed successfully. The client must take additional action to complete the request. This class of status code indicates that further action needs to be taken by the user agent to fulfil the request. The action required may be carried out by the user agent without interaction with the user if and only if the method used in the second request is GET or HEAD. A user agent should not automatically redirect a request more than five times, since such redirections usually indicate an infinite loop. This is an example of industry practice contradicting the standard. The HTTP/1.0 specification (RFC 1945) required the client to perform a temporary redirect (the original describing phrase was “Moved Temporarily”), but popular browsers implemented 302 with the functionality of a 303 See Other. Therefore, HTTP/1.1 added status codes 303 and 307 to distinguish between the two behaviours.However, some Web applications and frameworks use the 302 status code as if it were the 303. Reserved for future use. The original intention was that this code might be used as part of some form of digital cash or micropayment scheme, but that has not happened, and this code is not usually used. As an example of its use, however, Apple’s defunct MobileMe service generated a 402 error if the MobileMe account was delinquent. In addition, YouTube uses this status if a particular IP address has made excessive requests, and requires the person to enter a CAPTCHA. Not part of the HTTP standard, but returned by the Twitter Search and Trends API when the client is being rate limited. Other services may wish to implement the 429 Too Many Requests response code instead. The request failed due to failure of a previous request (e.g. a PROPPATCH). Indicates the method was not executed on a particular resource within its scope because some part of the method’s execution failed causing the entire method to be aborted. Defined in drafts of “WebDAV Advanced Collections Protocol”, but not present in “Web Distributed Authoring and Versioning (WebDAV) Ordered Collections Protocol”. Used in Exchange ActiveSync if there either is a more efficient server to use or the server can’t access the users’ mailbox. The server either does not recognize the request method, or it lacks the ability to fulfill the request. Usually this implies future availability (eg. a new feature of a web-service API). The server detected an infinite loop while processing the request (sent in lieu of 208). Further extensions to the request are required for the server to fulfil it. The client needs to authenticate to gain network access. Intended for use by intercepting proxies used to control access to the network (e.g. “captive portals” used to require agreement to Terms of Service before granting full Internet access via a Wi-Fi hotspot). HTTP defines methods (sometimes referred to as verbs) to indicate the desired action to be performed on the identified resource. What this resource represents, whether pre-existing data or data that is generated dynamically, depends on the implementation of the server. Often, the resource corresponds to a file or the output of an executable residing on the server. The HTTP/1.0 specification:section 8 defined the GET, POST and HEAD methods and the HTTP/1.1 specification:section 9 added 5 new methods: OPTIONS, PUT, DELETE, TRACE and CONNECT. By being specified in these documents their semantics are well known and can be depended upon. Any client can use any method and the server can be configured to support any combination of methods. If a method is unknown to an intermediate it will be treated as an unsafe and non-idempotent method. There is no limit to the number of methods that can be defined and this allows for future methods to be specified without breaking existing infrastructure. For example WebDAV defined 7 new methods and RFC5789 specified the PATCH method. Requests a representation of the specified resource. Requests using GET should only retrieve data and should have no other effect. (This is also true of some other HTTP methods.) The W3C has published guidance principles on this distinction, saying, “Web application design should be informed by the above principles, but also by the relevant limitations.” See safe methods below. Requests that the server accept the entity enclosed in the request as a new subordinate of the web resource identified by the URI. The data POSTed might be, as examples, an annotation for existing resources; a message for a bulletin board, newsgroup, mailing list, or comment thread; a block of data that is the result of submitting a web form to a data-handling process; or an item to add to a database. Requests that the enclosed entity be stored under the supplied URI. If the URI refers to an already existing resource, it is modified; if the URI does not point to an existing resource, then the server can create the resource with that URI. Echoes back the received request so that a client can see what (if any) changes or additions have been made by intermediate servers. Returns the HTTP methods that the server supports for specified URL. This can be used to check the functionality of a web server by requesting ‘*’ instead of a specific resource. Converts the request connection to a transparent TCP/IP tunnel, usually to facilitate SSL-encrypted communication (HTTPS) through an unencrypted HTTP proxy. Is used to apply partial modifications to a resource. HTTP servers are required to implement at least the GET and HEAD methods and, whenever possible, also the OPTIONS method. In HTTP/0.9 and 1.0, the connection is closed after a single request/response pair. In HTTP/1.1 a keep-alive-mechanism was introduced, where a connection could be reused for more than one request. Such persistent connections reduce request latency perceptibly, because the client does not need to re-negotiate the TCP connection after the first request has been sent. Another positive side effect is that in general the connection becomes faster with time due to TCP’s slow-start-mechanism. Version 1.1 of the protocol also made bandwidth optimization improvements to HTTP/1.0. For example, HTTP/1.1 introduced chunked transfer encoding to allow content on persistent connections to be streamed rather than buffered. HTTP pipelining further reduces lag time, allowing clients to send multiple requests before waiting for each response. Another improvement to the protocol was byte serving, where a server transmits just the portion of a resource explicitly requested by a client. Hidden variables within web forms. Query string parameters, for example, /index.php?session_id=some_unique_session_code. HTTP header fields are components of the message header of requests and responses in the Hypertext Transfer Protocol (HTTP). They define the operating parameters of an HTTP transaction. The header fields are transmitted after the request or response line, which is the first line of a message. Header fields are colon-separated name-value pairs in clear-text string format, terminated by a carriage return (CR) and line feed (LF) character sequence. The end of the header fields is indicated by an empty field, resulting in the transmission of two consecutive CR-LF pairs. Long lines can be folded into multiple lines; continuation lines are indicated by the presence of a space (SP) or horizontal tab (HT) as the first character on the next line. The Domain Name System (DNS) is a hierarchical distributed naming system for computers, services, or any resource connected to the Internet or a private network. It associates various information with domain names assigned to each of the participating entities. Most prominently, it translates easily memorizeddomain names to the numerical IP addresses needed for the purpose of locating computer services and devices worldwide. By providing a worldwide, distributedkeyword-based redirection service, the Domain Name System is an essential component of the functionality of the Internet. The Session Initiation Protocol (SIP) is a signaling communications protocol, widely used for controlling multimedia communication sessions such as voiceand video calls over Internet Protocol (IP) networks. The protocol defines the messages that are sent between peers which govern establishment, termination and other essential elements of a call. SIP can be used for creating, modifying and terminating two-party (unicast) or multiparty (multicast) sessions consisting of one or several media streams. Other SIP applications include video conferencing, streaming multimedia distribution, instant messaging, presence information, file transfer, fax over IP and online games. Originally designed by Henning Schulzrinne and Mark Handley in 1996, SIP has been developed and standardized in RFC 3261 under the auspices of theInternet Engineering Task Force (IETF). It is an application layer protocol designed to be independent of the underlying transport layer; it can run on Transmission Control Protocol (TCP), User Datagram Protocol (UDP) or Stream Control Transmission Protocol (SCTP). It is a text-based protocol, incorporating many elements of the Hypertext Transfer Protocol (HTTP) and the Simple Mail Transfer Protocol (SMTP). SIP works in conjunction with several other application layer protocols that identify and carry the session media. Media identification and negotiation is achieved with the Session Description Protocol (SDP). For the transmission of media streams (voice, video) SIP typically employs the Real-time Transport Protocol (RTP), which may be secured with the Secure Real-time Transport Protocol (SRTP). For secure transmissions of SIP messages the protocol may be encrypted withTransport Layer Security (TLS). File Transfer Protocol (FTP) is a standard network protocol used to transfer files from one host to another host over a TCP-based network, such as the Internet. FTP is built on a client-server architecture and uses separate control and data connections between the client and the server. FTP users may authenticate themselves using a clear-text sign-in protocol, normally in the form of a username and password, but can connect anonymously if the server is configured to allow it. For secure transmission that hides (encrypts) the username and password, and encrypts the content, FTP is often secured with SSL/TLS (“FTPS”). SSH File Transfer Protocol (“SFTP”) is sometimes also used instead, but is technologically different. The first FTP client applications were command-line applications developed before operating systems had graphical user interfaces, and are still shipped with most Windows, Unix, and Linux operating systems. Dozens of FTP clients and automation utilities have since been developed for desktops, servers, mobile devices, and hardware, and FTP has been incorporated into hundreds of productivity applications, such as Web page editors. FTP may run in active or passive mode, which determines how the data connection is established. In active mode, the client creates a TCP control connection. In situations where the client is behind a firewall and unable to accept incoming TCP connections, passive mode may be used. In this mode, the client uses the control connection to send a PASV command to the server and then receives a server IP address and server port number from the server, which the client then uses to open a data connection from an arbitrary client port to the server IP address and server port number received. Both modes were updated in September 1998 to support IPv6. Further changes were introduced to the passive mode at that time, updating it to extended passive mode. Simple Mail Transfer Protocol (SMTP) is an Internet standard for electronic mail (e-mail) transmission across Internet Protocol (IP) networks. SMTP was first defined by RFC 821 (1982, eventually declared STD 10), and last updated by RFC 5321 (2008) which includes the Extended SMTP (ESMTP) additions, and is the protocol in widespread use today. SMTP uses TCP port 25. The protocol for new submissions (MSA) is effectively the same as SMTP, but it uses port 587 instead. SMTP connections secured bySSL are known by the shorthand SMTPS, though SMTPS is not a protocol in its own right. While electronic mail servers and other mail transfer agents use SMTP to send and receive mail messages, user-level client mail applications typically use SMTP only for sending messages to a mail server for relaying. For receiving messages, client applications usually use either the Post Office Protocol (POP) or the Internet Message Access Protocol (IMAP) or a proprietary system (such as Microsoft Exchange or Lotus Notes/Domino) to access their mail box accounts on a mail server. A cookie, also known as an HTTP cookie, web cookie, or browser cookie, is a small piece of data sent from a website and stored in a user’s web browserwhile a user is browsing a website. When the user browses the same website in the future, the data stored in the cookie is sent back to the website by the browser to notify the website of the user’s previous activity. Cookies were designed to be a reliable mechanism for websites to remember the state of the website or activity the user had taken in the past. This can include clicking particular buttons, logging in, or a record of which pages were visited by the user even months or years ago. Although cookies cannot carry viruses, and cannot install malware on the host computer, tracking cookies and especially third-party tracking cookies are commonly used as ways to compile long-term records of individuals’ browsing histories—a potential privacy concern that prompted European and US law makers to take action in 2011. Cookies can also store passwords and forms a user has previously entered, such as a credit card number or an address. When a user accesses a website with a cookie function for the first time, a cookie is sent from server to the browser and stored with the browser in the local computer. Later when that user goes back to the same website, the website will recognize the user because of the stored cookie with the user’s information. Other kinds of cookies perform essential functions in the modern web. Perhaps most importantly, authentication cookies are the most common method used by web servers to know whether the user is logged in or not, and which account they are logged in under. Without such a mechanism, the site would not know whether to send a page containing sensitive information, or require the user to authenticate himself by logging in. The security of an authentication cookie generally depends on the security of the issuing website and the user’s web browser, and on whether the cookie data is encrypted. Security vulnerabilities may allow a cookie’s data to be read by a hacker, used to gain access to user data, or used to gain access (with the user’s credentials) to the website to which the cookie belongs (see cross-site scripting and cross-site request forgery for examples). Your Web browser recognizes the request for a name and invokes your local resolver, passing to it the name “www.net.compsci.googleplex.edu”. The resolver checks its cache to see if it already has the address for this name. If it does, it returns it immediately to the Web browser, but in this case we are assuming that it does not. The resolver also checks to see if it has a local host table file. If so, it scans the file to see if this name has a static mapping. If so, it resolves the name using this information immediately. Again, let’s assume it does not, since that would be boring. The resolver generates a recursive query and sends it to “ns1.xyzindustries.com” (using that server’s IP address, of course, which the resolver knows). The local DNS server receives the request and checks its cache. Again, let’s assume it doesn’t have the information needed. If it did, it would return the information, marked “non-authoritative”, to the resolver. The server also checks to see if it has in its zone resource records that can resolve “www.net.compsci.googleplex.edu”. Of course it does not, in this case, since they are in totally different domains. “ns1.xyzindustries.com” generates an iterative request for the name and sends it to a root name server. The root name server does not resolve the name. It returns the name and address of the name server for the “.edu” domain. “ns1.xyzindustries.com” generates an iterative request and sends it to the name server for “.edu”. 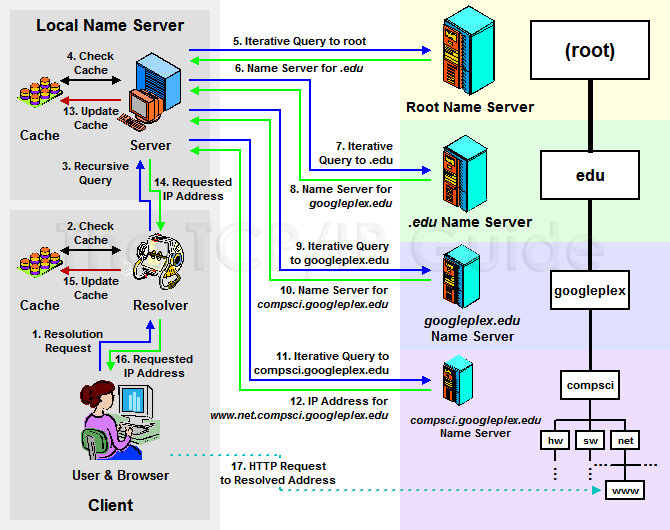 The name server for “.edu” returns the name and address of the name server for the “googleplex.edu” domain. “ns1.xyzindustries.com” generates an iterative request and sends it to the name server for “googleplex.edu”. The name server for “googleplex.edu” consults its resource records. It sees, however, that this name is in the “compsci.googleplex.edu” subdomain, which is in a separate zone. It returns the name server for that zone. “ns1.xyzindustries.com” generates an iterative request and sends it to the name server for “compsci.googleplex.edu”. The name server for “compsci.googleplex.edu” is authoritative for “www.net.compsci.googleplex.edu”. It returns the IP address for that host to “ns1.xyzindustries.com”. The local name server returns the resolution to the resolver on your local machine. Your local resolver also caches the information. The local resolver gives the address to your browser. Your browser commences an HTTP request to the Googleplex machine’s IP address. This fairly complex example illustrates a typical DNS name resolution using both iterative and recursive resolution. The user types in a DNS name (“www.net.compsci.googleplex.edu”) into a Web browser, which causes a DNS resolution request to be made from her client machine’s resolver to a local DNS name server. That name server agrees to resolve the name recursively on behalf of the resolver, but uses iterative requests to accomplish it. These requests are sent to a DNS root name server, followed in turn by the name servers for “.edu”, “googleplex.edu” and ‘compsci.googleplex.edu”. The IP address is then passed to the local name server and then back to the user’s resolver and finally, her Web browser software. Seems rather complicated and slow. Of course, computers work faster than you can read (or I can type, for that matter.) Even given that, the benefits of caching are obvious—if the name was in the cache of the resolver or the local DNS server, most of these steps would be avoided. A uniform resource locator, abbreviated URL, also known as web address, is a specific character string that constitutes a reference to a resource. In most web browsers, the URL of a web page is displayed on top inside an address bar. An example of a typical URL would be “http://en.example.org/wiki/Main_Page&#8221;. A URL is technically a type of uniform resource identifier (URI), but in many technical documents and verbal discussions, URL is often used as a synonym for URI, and this is not considered a problem. Next Post Objective 2.01 Articulate the role of F5 products.